John Emerich Edward Dalberg-Acton, 1st Baron Acton, KCVO DL (10 January 1834 – 19 June 1902)—known as Sir John Dalberg-Acton, 8th Baronet, from 1837 to 1869 and usually referred to simply as Lord Acton—was an English Catholic historian, politician, and writer. He was the only son of Sir Ferdinand Dalberg-Acton, 7th Baronet and a grandson of the Neapolitan admiral Sir John Acton, 6th Baronet. He is perhaps best known for the remark, "Power tends to corrupt, and absolute power corrupts absolutely. Great men are almost always bad men." This idea has been tested in laboratory settings. Acton's grandfather, who in 1791 succeeded to the baronetcy and family estates in Shropshire, previously held by the English branch of the Acton family, represented a younger branch which had transferred itself first to France and then to Italy. However, by the extinction of the elder branch, the admiral became head of the family. His eldest son, Richard, married Marie Louise Pelline, the only daughter and heiress of Emmerich Joseph, 1st Duc de Dalberg, a naturalised French noble of ancient German lineage who had entered the French service under Napoleon and represented Louis XVIII at the Congress of Vienna in 1814. After Sir Richard Acton's death in 1837, she became the wife of the 2nd Earl Granville (1840). Marie Louise Pelline de Dalberg was heiress of Herrnsheim in Germany. She became the mother of John Dalberg-Acton who was born in Naples. From an old Roman Catholic family, young Acton was educated at Oscott College under future-Cardinal Nicholas Wiseman until 1848 and then at Edinburgh where he studied privately. At Munich, Acton resided in the house of Johann Joseph Ignaz von Döllinger, theologian and forerunner of the Old Catholic Church, with whom he became lifelong friends. His attempt to be admitted to study at the University of Cambridge failed because he was a Catholic. Nonetheless, Döllinger had inspired in him a deep love of historical research and a profound conception of its functions as a critical instrument, particularly in the history of liberty. He was a master of the principal foreign languages and began at an early age to collect a magnificent historical library, with the object—which, however, he never realised—of writing a great "History of Liberty." In politics, he was always an ardent Liberal. In 1859, Acton settled in England, at his country house, Aldenham, in Shropshire. He returned to the House of Commons that same year as member for the Irish Borough of Carlow and became a devoted admirer and adherent of Prime Minister William Ewart Gladstone. However, Acton was not an active MP, and his parliamentary career came to an end after the general election of 1865, when he headed the Liberal ballot for Bridgnorth near his Shropshire home. Acton defeated Conservative leader Henry Whitmore, who successfully petitioned for a scrutiny of the ballots, and thus retained his own seat and Acton lost his new seat. After the Reform Act 1867, Acton again contested Bridgnorth, this time reduced to a single seat, in 1868 but to no avail. Acton took a great interest in the United States, considering its federal structure the perfect guarantor of individual liberties. During the American Civil War, his sympathies lay entirely with the Confederacy, for their defence of States' Rights against a centralised government that he believed would, by what he thought to be all historical precedent, inevitably turn tyrannical. His notes to Gladstone on the subject helped sway many in the British government to sympathise with the South. After the South's surrender, he wrote to Robert E. Lee that "I mourn for the stake which was lost at Richmond more deeply than I rejoice over that which was saved at Waterloo," adding that he "deemed that you were fighting battles for our liberty, our progress, and our civilization." In 1869 Queen Victoria raised Acton to the peerage as Baron Acton, of Aldenham in the County of Shropshire. His elevation came primarily through the intercession of Gladstone. The two were intimate friends and frequent correspondents. Matthew Arnold said that "Gladstone influences all round him but Acton; it is Acton who influences Gladstone." 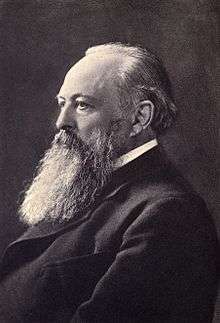 Lord Acton became ill in 1901 and died on 19 June 1902 in Tegernsee. 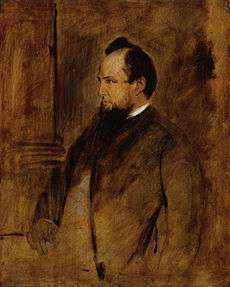 He was succeeded in the title by his son, Richard Lyon-Dalberg-Acton, 2nd Baron Acton. His 60,000-volume library, formed for use and not for display and composed largely of books full of his own annotations, was bought immediately after his death by Andrew Carnegie and presented to John Morley, who forthwith gave it to the University of Cambridge. 1 2 3 Dod, Robert P. (1860). The Peerage, Baronetage and Knightage of Great Britain and Ireland. London: Whitaker and Co. p. 83. ↑ Bendahan, S.; Zehnder, C.; Pralong, F. P.; Antonakis, J. (2015). "Leader corruption depends on power and testosterone". The Leadership Quarterly. 26 (2): 101–122. doi:10.1016/j.leaqua.2014.07.010. 1 2 3 Gronbacher, Gregory (2008). "Acton, Lord (1834–1902)". In Hamowy, Ronald. The Encyclopedia of Libertarianism. Thousand Oaks, CA: SAGE; Cato Institute. pp. 4–5. ISBN 978-1-4129-6580-4. LCCN 2008009151. OCLC 750831024. ↑ 4 Nov 1866, letter to Robert E. Lee, The Acton-Lee Correspondence at lewrockwell.com, accessed 21 February 2011. ↑ Norman, Edward (1988). Cannon, John, ed. The Blackwell Dictionary of Historians. Oxford; New York: Basil Blackwell Ltd. p. 1. ISBN 0-631-14708-X. ↑ MacDougall, Hugh A. (1962). The Acton/Newman Relations: The Dilemma of Christian Liberalism. Fordham University Press. ↑ Tonsor, Stephen J (1959). "Lord Acton on Dollinger's Historical Theology". Journal of the History of Ideas. 20 (3): 329–352. doi:10.2307/2708113. ↑ Herbermann, Charles, ed. (1913). "John Emerich Edward Dalberg Acton, Baron Acton". Catholic Encyclopedia. New York: Robert Appleton Company. ↑ Lectures on Modern History (1895) Appendix I. at Project Gutenberg. ↑ Lectures on Modern History (1895) Lecture XI, The Puritan Revolution. at Project Gutenberg. ↑ Lectures on the French Revolution (1910) Macmillan, p. 92, at Project Gutenberg. ↑ A Lecture on the Study of History, 1895 Macmillan (1911), p. 3, at Project Gutenberg. ↑ John Acton Quotes from brainyquote.com Accessed 21 February 2011. ↑ as quoted in The American Political Science Review vol.56, 1963 from The Rambler (1860) p. 146. This article incorporates text from a publication now in the public domain: Chisholm, Hugh, ed. (1911). "Acton (John Emerich Edward Dalberg Acton), 1st Baron". Encyclopædia Britannica (11th ed.). Cambridge University Press. Himmelfarb, Gertrude (1952). Lord Action: A Study in Conscience and Politics. Chicago, IL: University of Chicago Press.